Before we get started, I should state that both recipes and decor ideas can be used with mason jars. I’ll cover both here because they’re all awesome! So for starters, every section in this article calls for a mason jar. I like to switch things up and use different sizes. 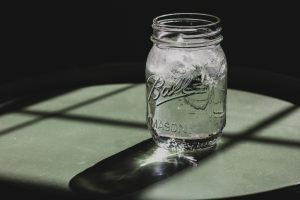 If you don’t have some old mason jars that you aren’t using, you can find some at your local Walmart or Dollar Store. I bought mine at Walmart (okay full disclosure, I work there, so I do get a discount, but without the discount they are still quite affordable!). If you’re stuck, Amazon sells a variety of them at a comparable price to Walmart — The only disadvantage is you need to wait for them to ship to you! For something so simple, these jars make great decorative projects to spruce up both your interior and exterior living spaces. There’s loads of unique ideas on Pinterest. 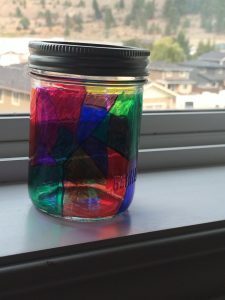 My favorite craft is the fall leaves jar (Tutorial found on Spark & Chemistry). 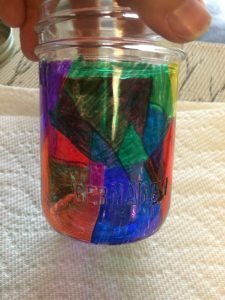 Simply head outside on a nice fall day and collect some leaves, grab some mod podge, a nice sponge brush and paint these leaves onto the front of your jar. They make a lovely luminary when done or you can use as any sort of decorative vase. For an added flourish, I like to add a bow with some nice fall themed ribbon. I love the idea of these and they are relatively easy to make. I’ve used mason jars to store my makeup supplies. I like to dress them up with ribbons along the neck of the jar, you can even use blackboard stickers to create neat little labels. They are quite versatile when it comes to creating storage. I’ve even seen some inspiration on Pinterest to take some mason jars and attach them to a piece of barn wood and hang it on your bathroom wall for a unique twist. Check out a sweet tutorial at The DIY Playbook. A spin on my earlier Halloween Inspired Post. This time, we’re just using sharpies! One tip is to wash the jar in soapy water for a bit to remove any dust or granules that might randomly be on the surface, but other than that, you are simply drawing on a design of your choosing in sharpie markers onto the surface of the jar. For my project, I choose a random geometric design. I got the idea from Happy Hooligans. I recommend having a paper towel on your work surface (you don’t need a huge wad, but be prepared for a few marker mishaps!). These jars make the perfect “individual” size serving in most cases, which makes them so awesome for a unique spin on your regular recipes. There are scads of mason jar salad recipes on the internet, it’s a great way to portion off an individual salad for either a lunch or heck, a way to serve it up uniquely at a dinner party! It’s relatively simple, take your favorite salad and split it up evenly into a few mason jars. For extra tips, check out a helpful post from CookSmarts. Like the salad idea, here’s another way to showcase a dessert for people. Some desserts may be hard to individualize, but you can make dirt cake or pudding parfaits easily with mason jars. I think you can probably get reasonably creative with this, Pinterest is a seemingly never-ending resource to find a way to do this with a variety of your favorite dessert recipes! Do you have a favorite recipe that you’d love to share with your friends? I’ve handed out little mason jars of jam, with the recipe printed on some nice paper attached to the lid. You can even package up a sample of cookies or brownies depending on the size of the jar. It’s a great way to create something unique to give to a friend. 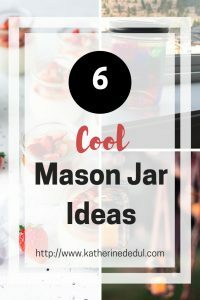 I may have only highlighted six different ways to use mason jars, but I’m sure you can find numerous other ways with a little research. 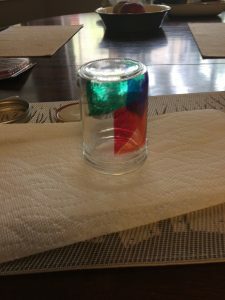 These jars are incredibly versatile in their uses and I’d love to hear from you if you have a favorite craft (either from above or one of your own), leave a comment down below or share this content on your favorite platform. Pin this content to Pinterest!